Follow us on this “cannot miss” route for a bikeride through Brooklyn. It will keep you busy for a day. That is, if you stop for icecream, lunch, something to drink, do some shopping. It’s not like it’s work, right? Start at the beginning and rent a bike. Possible at various locations on Manhattan. Google “rent a bike” and you’ll find more than enough addresses. And don’t forget to ask for a map. You can also choose to take a cab or the subway to Brooklyn and rent a bike over there. Cycling in New York City isn't always that relaxed. The traffic is hectic and cars take little account of cyclists. So please, stay alert at all times. On the Brooklyn Bridge you follow the Brooklyn Bridge promenade in south-easterly direction. At the promenade you turn right onto Tillary Street and then left onto Cadman Plaza East. Make your way to Washington Street and there turn left to York Street. Go left once more and you are on Front Street in DUMBO. DUMBO stands for Down Under the Manhattan Bridge Overpass. It’s a nice area to check out with lots of little streets, shops and restaurants. You’ll find Grimaldi’s on 1 Front Street, the most famous pizzaplace in New York where there’s always a line. From Grimaldi's you bike in the direction of Old Fulton Street. From Old Fulton Street turn left towards the Brooklyn Bridge Park. Follow the bike path through Brooklyn Bridge Park along the east river and exit at Atlantic Avenue. There are some good stores on this part of Atlantic such as Urban Outfitters. Leave Atlantic at 5th Avenue and follow that up to 10th street. 5th Av in Brooklyn is known as a hip spot, just as 5th Av on Manhattan. I didn’t think much of it. Same goes for 3rd and 4th which have also been recommended on various websites. But, perhaps you’ll like it. Still, it was fun to have seen. We went into a cool vintage store and had a good pastrami sandwich at Zito’s on 5th. From 5th Av bike towards Prospect Park (you’ll see the signs around 10th Street). You can bike directly into Prospect Park, just follow the one-way traffic in the park and you're heading in the right direction. Or you choose to bike to the entrance of the park. In that case you stay outside the park and bike in the opposite direction of the cyclists in the park untill you reach the main entrance of Prospect Park. Here are the beautiful Park Slope and Prospect Heights. But, if you feel like checking out Jay Z’s Barclays Center before you head for the park, follow 5th Avenue towards Atlantic Avenue. With right across Barclays Center a shopping area. The Atlantic Terminal Mall houses a real nice Uniqlo, Target, DSW, Victoria's Secret, Marshall's etc. Then bike around Prospect Park. Which is by the same designer who also designed Central Park but who says that PP turned out better. Horsebackriding, soccer, football, tai chi and yoga classes, a zoo, people running, skating and biking, family get togethers with a barbecue….. you can find anything here. Just like in Central Park. After this round, exit at Eastern Parkway. With Brooklyn Museum across the street. Very famous and highly recommended. Maybe nice to take a look? From here you bike up Bedford Avenue (towards Manhattan) through a big orthodox Jewish neighbourhood (heading for Williamsburg). Eventhough I had been there before, with the Bike the Big Apple tour, I found it impressive all over again. Then bike past sort of an old portsite towards Dumbo. Follow the Brooklyn Bridge signs and bike back to Manhattan. Or return your bike and cross the bridge by foot. And enjoy the spectacular view of Manhattan. Already seen or “done” the Brooklyn Bridge? Another nice option is taking Bedford Avenue further up to Williamsburgbridge and take that bridge into Manhattan. 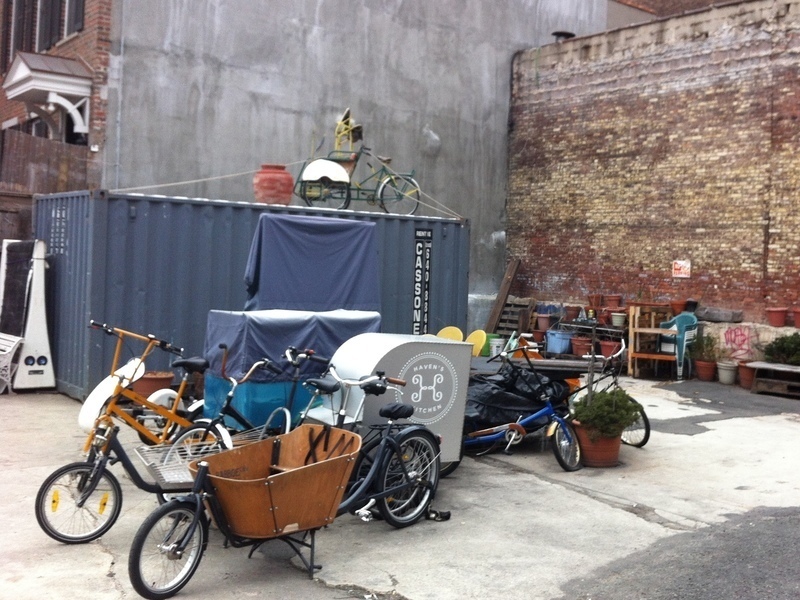 You will cycle along Williamsburg, a must if you're in Brooklyn. Wanna read more about biking in NY? Check out Bike the Big Apple with which we had a great day. Biking is a great way to explore NYC. Do it safe and be guided by Bike the Big Apple! In NYC the subway is refered to as “train”. It’s seen as the way to move across Manhattan. I woke up in the Paper Factory, put on my shoes and went for a run through Queens. Follow us on this “cannot miss” route for a bikeride through Brooklyn. A 6,5 km streetart route through the Lower East Side. With lots of cool art along the way. Have you lost track of what’s where in New York? No stress, we’ve come to your rescue. Having a tough time hailing a cab in New York? UBER is everyone’s private driver. Follow in our footsteps on a Friday-the-thirteenth route! So far for bad luck? “stand clear from the closing doors” Should you take the NYC sybway?